Hello! I’m Mark Livingston and I’m delighted to welcome you to WeddingSpeechesandVows.com, your online source for information about wedding speeches and toasts for the Wedding MC, best man, father of the groom, mother of the bride, bride, groom, father of the bride, bridesmaid, and friends and relatives of the newlyweds. Whether you’re the proud father of the groom, mother of the bride, best friend of the groom or bride, or a close relative or friend, WeddingSpeechesAndVows.com provides tips, advice, and resources for wedding speech templates and examples. If you’re the Bride or Groom we provide separate guides that show you who to thank in your speech. For other members of the bridal party we provide guides on what to include in your tribute to the newlyweds. WeddingSpeechesAndVows is about helping the bride and groom create a FUN and memorable time on their big day. And that goes well beyond speeches. Weddings should be FUN! And like any major event, a wedding takes planning to ensure everything runs smoothly. 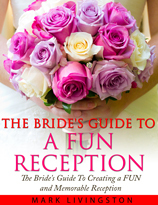 That’s why The Bride’s Guide To A FUN Reception was created – to make reception planning not only easier for the bride but also to show the bride how to make her reception a fun celebration of one of the most important days of her life. It includes wedding games, entertainment ideas, sample reception agendas, how to create your reception timeline, order of wedding toasts and speeches, checklists and preparation forms for the Wedding MC, and much, much more. Click the following link for The Bride’s Guide To A FUN Reception to see how you can create a FUN reception. If you’re the bride – congratulations! It’s an exciting time for you. Sometimes the Bride will join her wonderful Groom and give a thank you speech. It’s one of the most highly anticipated moments at the reception and it’s well worth taking the time to write something that’s emotional and heartfelt. As you know, there’s a lot of planning to do to make the celebration of your marriage a day to remember for years to come. There are so many details to attend to – choosing stationery, searching for a beautiful gown, selecting key players including caterer, baker, florist, photographer, officiant, and hair stylist, choosing a reception venue, buying favors or if you’re a DIY Bride, making them yourself. It’s a daunting task – even more so without a guide to follow. I’m delighted to let you know that I’ve prepared a detailed checklist and timeline in the Planning section to help you prepare for your special day. As well, I provide a resource for choosing a bridal hairstyle that makes you look beautiful and radiant as you walk down the aisle. And finally, you’re invited to download your copy of the Bridal Emergency Kit Checklist – an essential list of items to take with you to your ceremony location. If you’re the groom – I extend my warmest congratulations to you too. While most of the planning will be in your future Bride’s hands, you’ll have one important task to do at the reception. And that’s to give a Groom’s Speech. Your guests will be excited to hear from you. They’ll want to know your feelings on your wedding day and they’ll want to hear acknowledgements for their gifts, for their contribution to the wedding, and for their importance in your life. Your words will be a high point to many guests so it’s important that you know what to say so that everyone feels included. I’ve also created a Groom’s Emergency Kit Checklist for you to put together and take with you to the ceremony. 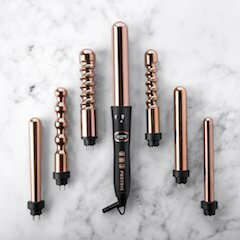 These are those little essentials that make the ceremony and reception go smoothly for you so you can enjoy your special day. Paying tribute to the Bride and Groom is an age old tradition. Sometimes it’s an “open” event where all the guests are invited to participate. Often, though, specific guests and members of the bridal party pay tribute to the newlyweds before they speak. Those guests can include the Father of the Groom, the Father of the Bride, the Mother of the Bride, the Maid of Honor, the Best Man, a close friend or relative, and even the Wedding MC. Many people who visit WeddingSpeechesAndVows.com find my Order of Wedding Speeches and Toasts a valuable guide as they plan this event at the reception. Helping you prepare your wedding speech is just one of my goals as you visit with us today. In fact, I provide tips and advice for other key players involved in the reception. One of the key players at any reception is the Wedding MC. It’s such an important role at the reception that I’ve devoted a complete section to information about or resources and guides for areas specifically for the Master of Ceremonies including wedding jokes, scripts, agendas, run sheets, games, introductions, checklists, timelines, tips, and ideas. The Master of Ceremonies is an entertainer…and a co-ordinator. That’s why I provide valuable information not only on MC Speeches but also advice on how to help the Master of Ceremonies in his – or her – duties. And it doesn’t matter whether you’re a Master of Ceremonies in Sydney, Australia, or Toronto, Canada, or Los Angeles, United States, or London, England, or any city or town in between. And it doesn’t matter whether you’re conducting a reception in South Africa or the Bahamas or in New Zealand. These are tips and ideas about duties and jokes that will help you no matter where you are. 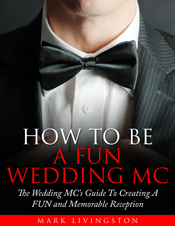 For example, you might want to think of me as your Wedding MC Coach because I help MCs prepare their agenda for the reception by giving them an outline of their MC duties and responsibilities. As well, I provide information – and a terrific resource that has been used by hundreds of MCs world wide – on how to plan a FUN wedding reception so it’s a successful and memorable occasion as the bride and groom celebrate their happy day with those who are important to them. This resource is helpful not only to the Master of Ceremonies but also to those who are planning the reception since it includes sample agendas, wedding games, entertainment ideas, wedding reception activities ideas, and a comprehensive guide for the reception events. When thousands of dollars are spent preparing for one of the most important days of a couple’s life it’s important to make sure the guests are not only impressed but also have fun. 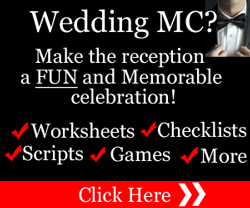 To find out how this guide can help you plan a fun filled reception, click on the following link for the FUN Wedding MC Guide. A daughter’s wedding is truly an exciting time especially for the Mother of the Bride. If you’re the Mother of the Bride then chances are you’ll be directly involved in the planning. From helping to select a dress to planning the reception to entertaining guests, you’ll be devoted to making this a perfect day for your daughter. That’s why I’ve created a list of Mother of the Bride Duties. You’ll very likely want to pay tribute to your daughter and her groom with a speech or toast. That’s why I’ve prepared a Special Report for you to help you deliver your speech with poise and confidence. The Best Man plays an important role before, during, and after the ceremony. He’s the groom’s right hand man. That’s why I help the Best Man with his role by including a free checklist of 30 essential duties the Best Man performs. Of course, everyone expects a humorous presentation from the Best Man at the reception. It’s a time when the groom is poked fun at in a friendly way and I’ve prepared a guide for helping the Best Man create a tribute to both the Bride and Groom. There’s a special bond between a father and his son. And the reception is the perfect opportunity to show your pride and love for your son. If you’re the Father of the Groom look for my speech tips and ideas to make your tribute to your son and his beautiful wife something they’ll remember for years to come. Whatever your role is, I wish you a fun and exciting time at the upcoming celebration of the marriage of the bride and groom!